i made a lunchhour dash to a nearby salvation army op shop last week and the thrift gods were smiling down upon me when they dropped a bag full of crocheted granny squares in my lap for a mere $4.50. this was an extra exciting discovery for me because i've been taunted lately with images of adorable granny squares popping up here, there and everywhere and i personally am without the crochet *knack*. i admit i am somewhat skilled in many things but crochet just baffles me, time and time again. and now i have no further need to learn! some of the squares had already been sewn together so i'll be using them for a scarf but i'm looking for other creative suggestions for my loose stash... any ideas? 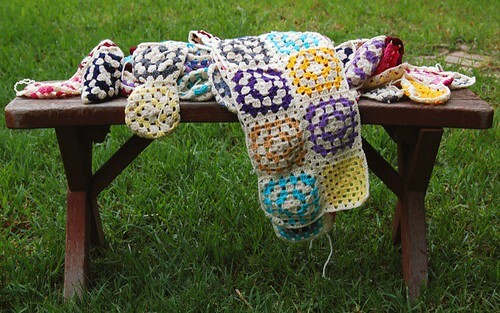 Love the way you photographed the granny squares outside! scarves are a great idea! some of bjork's promotional shots for her latest album show her in what appear to be crocheted sleeves & bodices. i like some of them very much ... the greys, dark purple, and browns. What a great find. I'm planning to learn how to make granny squares. Hopefully that goes well. I saw a tote bag made with granny squares at a local shop. It was really cute.